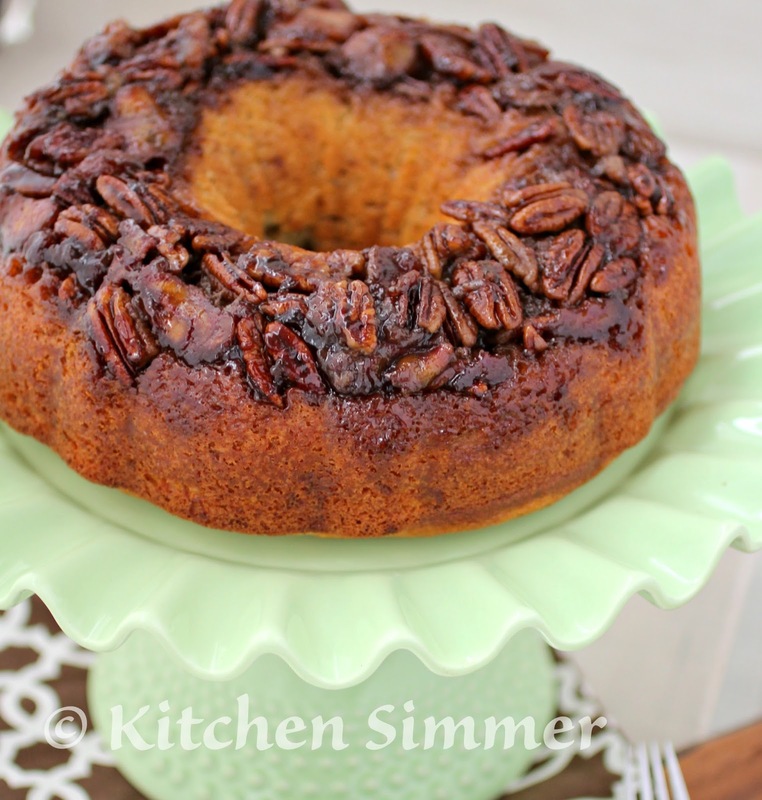 A banana and pecan topped bundt cake is a perfect sweet treat to end any meal or even as a snack with a cup of coffee. 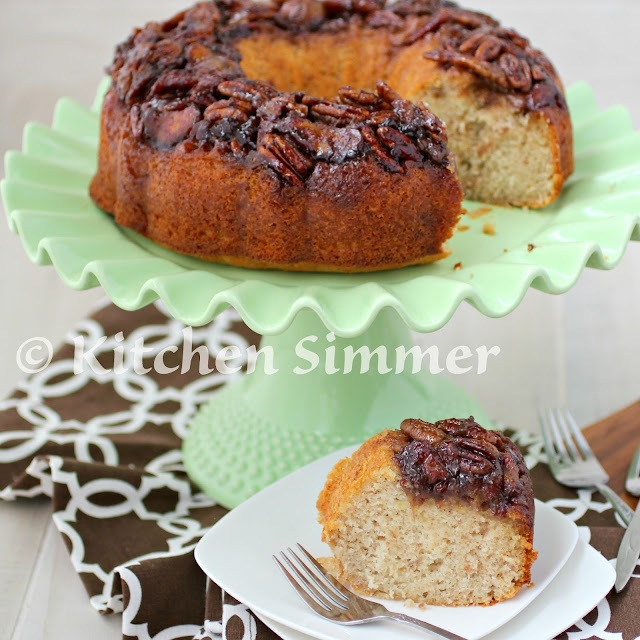 This cake is easily made with a box of cake mix, a few ripe bananas and some pecan nuts. I always seem to have ripe bananas sitting on my kitchen counter that need to be used up fast. I usually just slice them and put them in the freezer for smoothies, but today I wanted to make something sweet and extra yummy to eat. I love the idea of banana bread, but I really didn't feel like measuring ingredients and I wanted something fast and easy to bake. I grabbed a box of white cake mix and went to work. The first thing I did was make the topping. I had four bananas to use up so I sliced two of them and sauteed them in margarine and brown sugar. When the sugar started to thicken and get sticky, I added a large handful of pecans into the pan and cooked them up with the bananas. Then I mashed the other two bananas and made my cake mix according to the box instructions. My instructions actually asked for 1 1/4 cup of water, but I reduced the water to only 1 cup since I was adding the moist bananas in the cake. I added a nice teaspoon of cinnamon for good measure and layered the cake with the sauteed bananas and pecans on the bottom. I love playing around with cake mix and trying out new recipes... they always seem to work no matter what I try. This cake was amazing. My son ate a piece and for a boy that does not like bananas, he loved every bite. I took some over to my mother's house and she gave me a big thumbs up too. I have already decided that this will be one of the cakes I am going to make for our up coming family birthdays. I guess I better go buy more bananas to sit on my counter. Slice bananas and add to a pan with margarine or butter, salt, and brown sugar. Allow bananas to saute until sugar and butter thicken. Then add the pecans and cook for another minute. Mash the bananas and add all the ingredients for the cake mix with the cinnamon. Note: I recommend that you reduce the water by a 1/4 cup and not follow the full amount giving by the package instructions. The bananas provide some moisture to the cake mix so too much water can cause the cake to be soggy. Pour into a buttered or sprayed bundt pan. Layer all the sauteed banana/nut mixture on the bottom of the bundt pan. Then pour the cake batter over it and bake in a 350 degree oven for 40-45 minutes or until cake is done. Invert bundt pan over serving dish and allow to sit for a minute before removing. Serve hot or at room temperature. Enjoy. This cake looks easy to make using a box cake mix. That's my kind of recipe. I always have more ripe bananas than I know what to do with. I don't make bundt cakes nearly enough! Banana cakes are such a great way to use up ripe bananas. 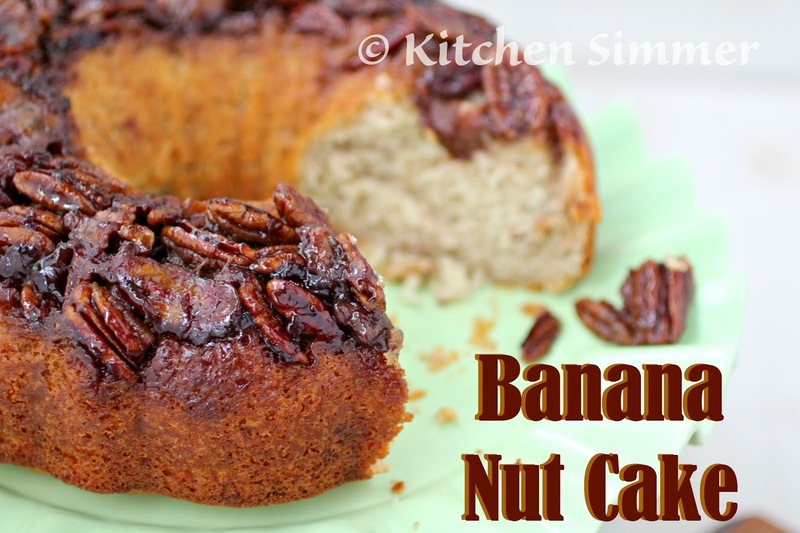 Banana and nuts go so well together, and this cake looks great. I love cakes that you can eat for breakfast...cause I would eat this cake for breakfast!! That sticky pecan topping is perfection! Oooh that topping, drooling over here. I NEED to make this! What a beautiful cake! And it looks so easy! This is so super cute and I love that you kept it simple with a boxed mix! YUM!! 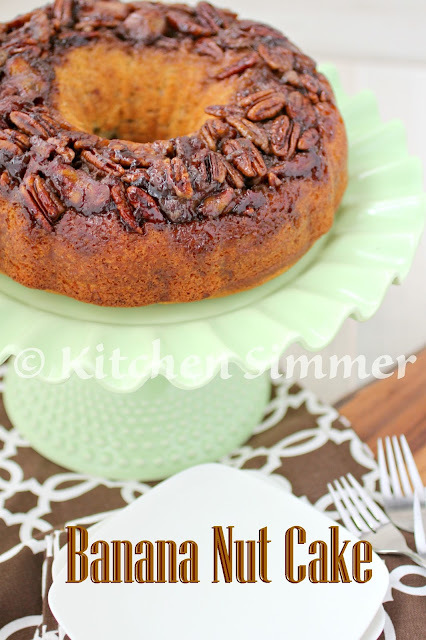 You know I've never met a bundt cake I didn't like and this one is no exception. Thankfully I always have bananas in the freezeer!